Mother’s Day is fast approaching (May 8th) and there is no better opportunity to recognize incredible mothers everywhere. Now, everyone knows that Mother’s Day is all about the brunch! Whether you’re honouring a new mom, step-mom, mother-in-law, mom or mommy-men, here is your guide to creating a special Sunday brunch to celebrate her. Combine 1 cup water and sugar into a small sauce pan to create a simple syrup. If using fresh or dried culinary lavender add that to your saucepan. Bring to a simmer and cook, stirring until the sugar has dissolved. Let cool to room temperature. Then strain lavender from simple syrup. 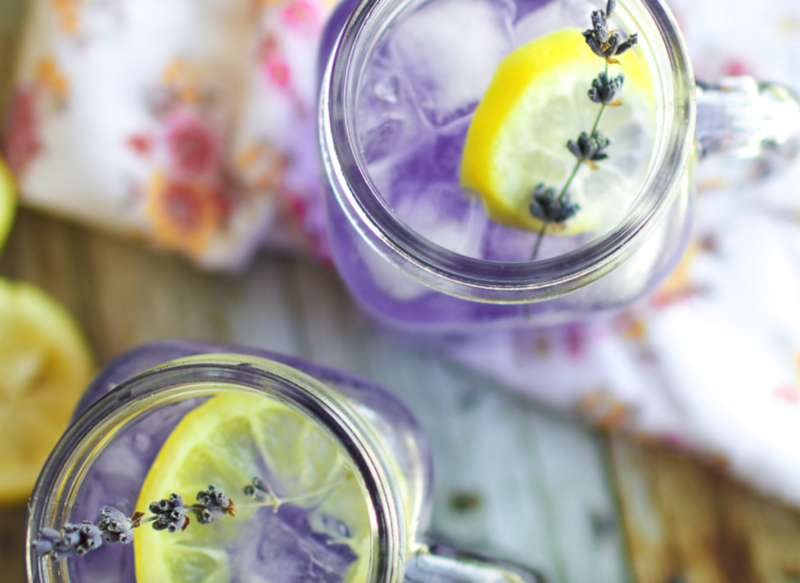 Combine lemon juice, strained simple syrup and water in a 1-quart pitcher. If using essential oil, add 2 drops of lavender oil here, and 1 drop of purple food colouring. Serve with ice and lemon slices. Place lemon wheels in rocks glass and add ice. Add 4 dashes of bitters and ½ ounce St. Germain. Thread grapes, pineapple, strawberries, honeydew and cantaloupe, alternatively onto skewers. Heat 1 tablespoon oil in a 10-inch nonstick ovenproof skillet over medium heat. Adding leeks, stirring often until softened (approximately 5 minutes). Add mushrooms, stirring often, until softened and all liquid has evaporated (8-10 minutes). Increase heat to medium-high and add remaining tablespoon of oil to skillet. Pour the egg mixture over the mushrooms and leeks, shaking the pan to evenly distribute the mixture. Add half of the Fontina cheese. Cook the frittata, without stirring, until its edges begin to set (approximately 5 minutes). Sprinkle cheese over frittata and transfer skillet to oven, baking until golden brown and center is set (approximately 25-30 minutes). Whisk flour, cocoa powder, brown sugar, salt, baking soda and backing powder in a large bowl. Make a well in the center and add egg yolks, buttermilk, oil and vanilla extract. Blend with a fork. Gradually add dry ingredients, mixing only until combined. In separate bowl, using an electric mixer on medium-high speed, beat egg whites until soft peaks form. Fold egg whites into batter, until combined. Heat waffle iron and lightly coat with nonstick vegetable oil spray, adding small batches of batter. 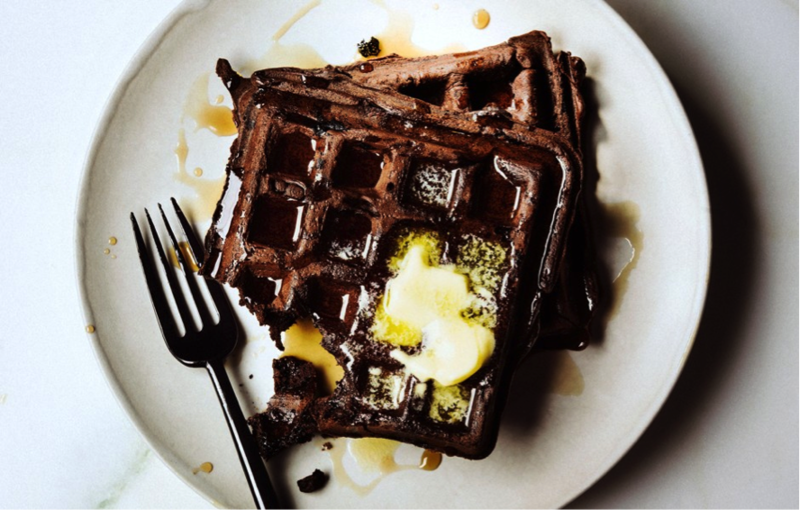 Remove waffles when cooked through. Keep warm in oven until ready to serve, placed on a wire rack that is set inside a baking sheet, covered loosely with foil. Capture the spirit of the day (and season) with a flower arrangement, as the centerpiece of your brunch spread, which also doubles as something mom can take home! 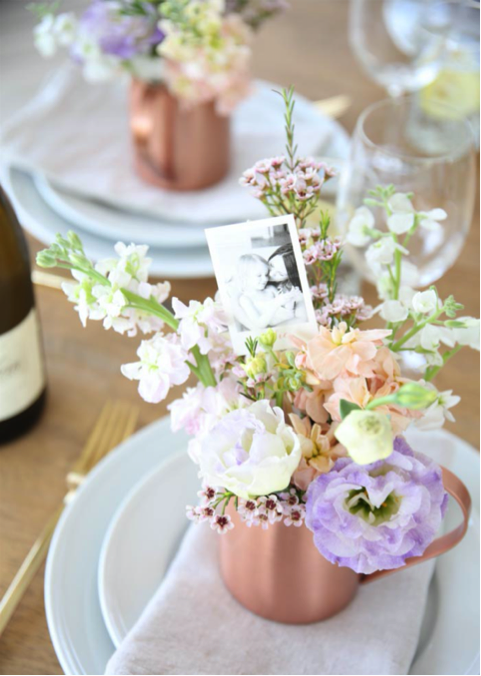 + Try personalizing the arrangement by incorporating a photo of mom and the family, or smaller arrangements in personalized mugs, placed on each setting. Stick to one or two colours (preferably your mom’s favourites), and don’t be afraid to mix and match vintage vases, dishes and tablecloths! Be sure to demarcate where mom is sitting by using a place card. 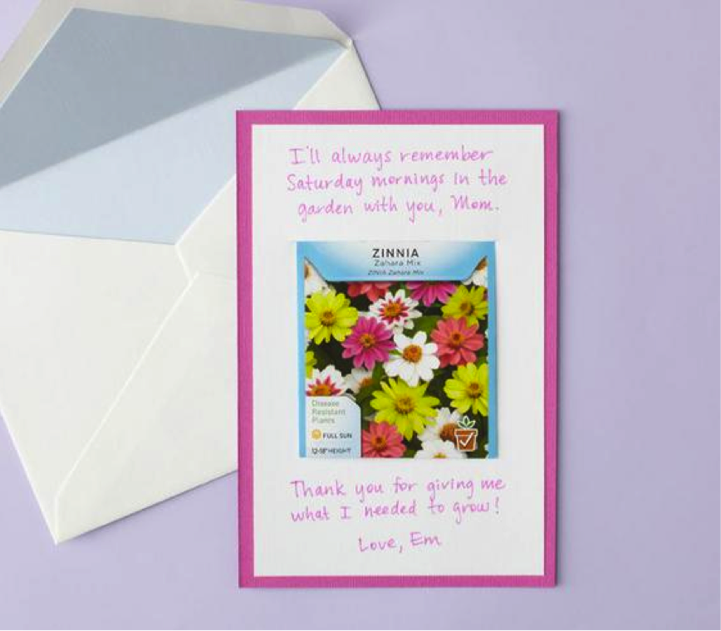 + Try personalizing her setting with a homemade card that incorporates a favourite memory, or printing your Mother’s Day brunch menu on her napkin (using iron-on transfer paper from Staples). 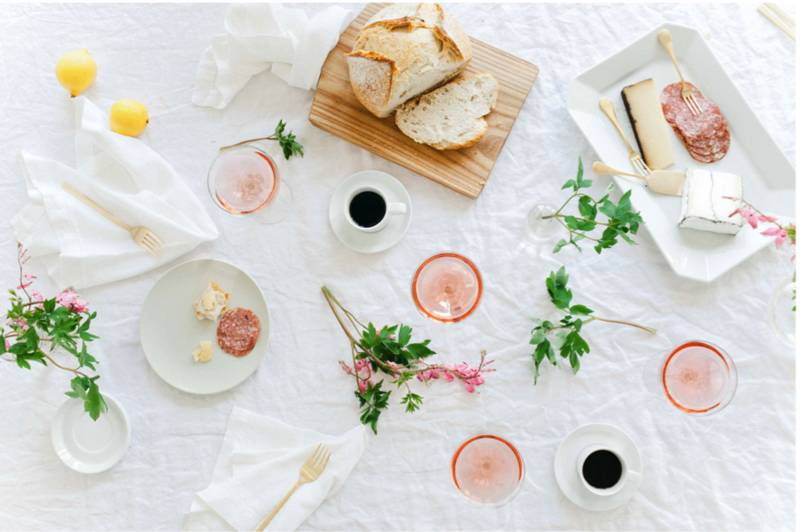 Hosting a brunch can get expensive, and the effort alone wouldn’t go unnoticed, which makes the purchase of a gift superfluous. But, if you’re unable to put a brunch together, or just want to get mom something small, here are some unique, inexpensive and DIY gift ideas! + Whether it is a bike tour of the city, gardening together, an hour at BeHot Yoga or a movie night – mom’s treasure that quality time spent together! 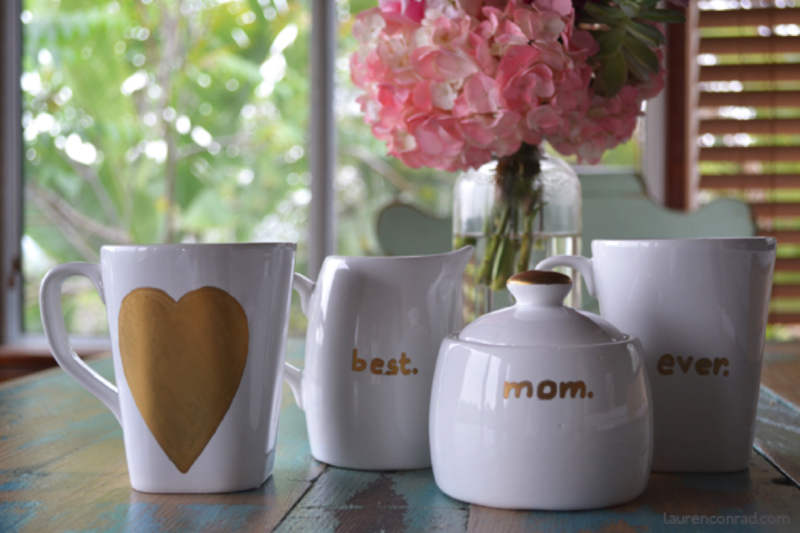 + Purchase a mug at Dollarama or thrift store and using a metallic paint pen (from DeSerres or Michaels), design a personalized mug for mom. Once dry, pop it in the oven for 30 minutes at 350 degrees to allow the paint to set permanently! 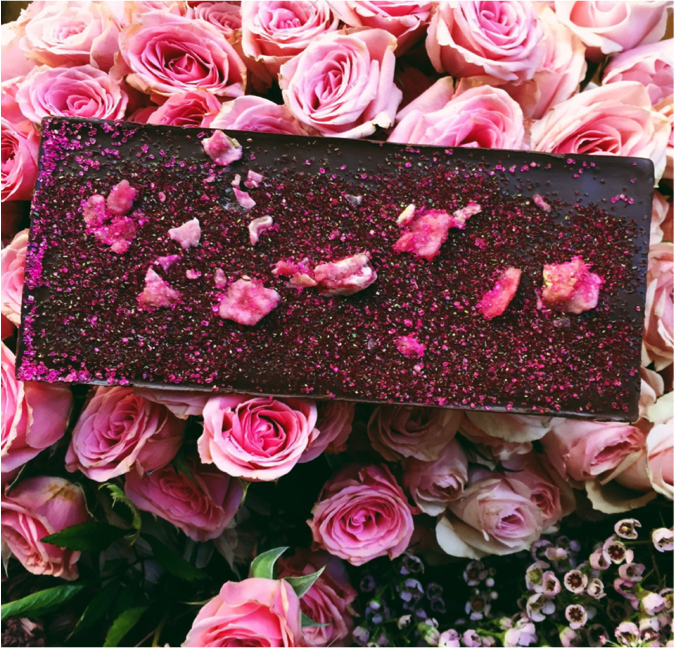 + For the chocolate loving mom, kick it up a notch, by ordering artfully handcrafted, gourmet chocolates from Compartés. + To help your mom with much deserved rest and relaxation, treat her to luxurious salt soaks for a spa day at home. 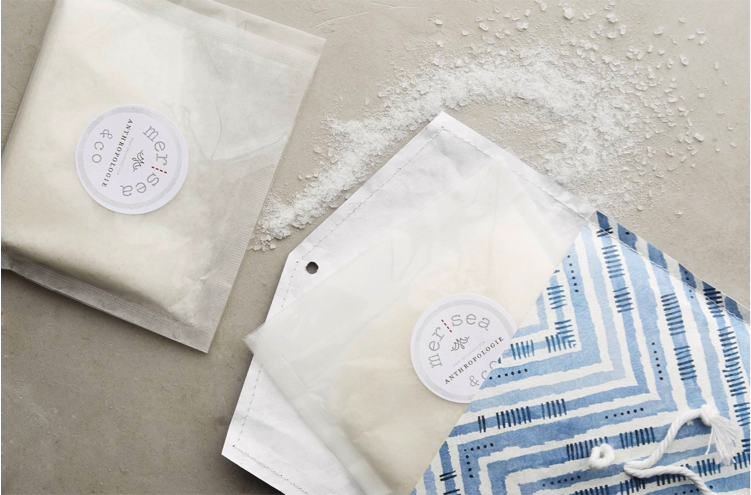 Try Mer|Sea & Co. Salt Soak from Anthropologie. 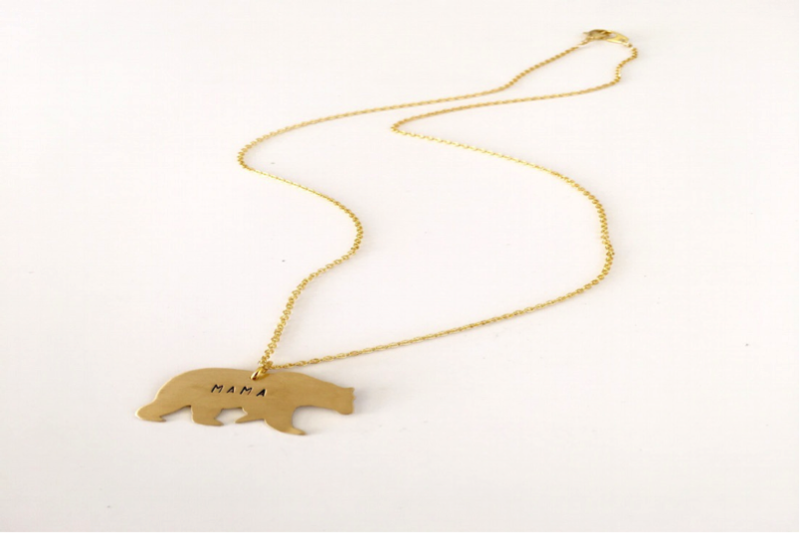 + Commemorate the true nature of motherhood with this hand-cut and stamped necklace by Océanne, sold exclusively at Brika ($48). If you’re short on time, it’s understandable. Consider booking a brunch reservation at Origin: http://origintoronto.com. Most importantly,just remember, when it comes to Mother’s Day – it really is the thought that counts!